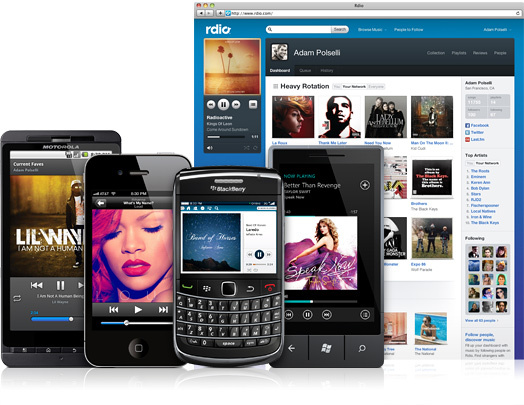 Rdio, which launched last year, is one of the later entrants to the digital music space alongside Pandora, MOG, Rhapsody and others. But it’s working hard to catch up by tapping developers to make its service widely available. The social music subscription service built by Skype, Joost and Kazaa founders Janus Friis and Niklas Zennstrom announced new mobile APIs today, enabling developers to build mobile applications with full access to Rdio’s songs, albums, playlists and social data. The new APIs are a follow up to a Web playback API introduced at South By Southwest and are part of what Rdio calls the most robust music APIs available in the industry. Developers can create their own apps and offer full playback of 8.5 million songs to users who subscribe to Rdio’s service. Or they can provide 30-second snippets of songs to customers who don’t have a subscription plan. Developers can also access song metadata and Rdio’s social stream, where users are able to discover songs from each other. Developers who steer users to Rdio for subscriptions can share in revenue through an affiliate program; a good incentive to get users to build out services and apps. The Web playback API was used to create Play by AOL, a new music application, and the GRAMMY Awards’ MusicMapper app. Ian McKellar, lead platform engineer at Rdio hopes to see a lot more apps with the new mobile API that can cover niche usage cases and drive overall subscriptions for Rdio. “Based on developer demand, we absolutely believe that this will increase our subscribership. We also feel really good about giving developers the tools we think they’ll need to be able to innovate and create cool and fun new iPhone (s aapl), iPad and Android (s goog) applications,” he said. Last week, Rdio also partnered last week with the Echo Nest, a music metadata platform, which has a community of 7,000 developers. Echo Nest will offer its APIs to developers so they can create apps that leverage Rdio’s music catalog and combine it with Echo Nest’s ability to categorize, filter, analyze and manipulate music. Developers who build apps with Echo Nest and Rdio will also be able to participate in Rdio’s affiliate program. I think Rdio is on the right path. It’s building an ecosystem that spreads Rdio’s service to a wider range of users and it’s helping to create a bunch of innovative apps that can offer a lot of robust music content; something most of its competitors don’t provide. But Rdio’s efforts are ultimately aimed at getting more paying subscribers, which ensures that it gets paid even as it opens up to new partners. It reminds me of the move Instapaper founder Marco Arment did in opening up his API in February, which allowed developers to build their own apps, while limiting functionality to customers who paid Instapaper’s $1 monthly subscription. That business strategy ensures Arment is able to keep making money while offering developers a chance to build off Instapaper. Rdio’s APIs are more attractive in some ways, however, because they offer the ability to get some money through referrals. By allowing developers to share in the revenue, it helps encourage more development and it may help Rdio avoid some of the developer friction Twitter has experienced as it grows and monetizes. Rdio still has to make money, which is very tough in the digital music business. And it has to compete against MOG, Spotify, Pandora and others who have a head start. But it’s making a savvy bet that it can compete and thrive with broad developer support. It’s no guarantee but I like the moves Rdio’s made so far in building up its ecosystem.